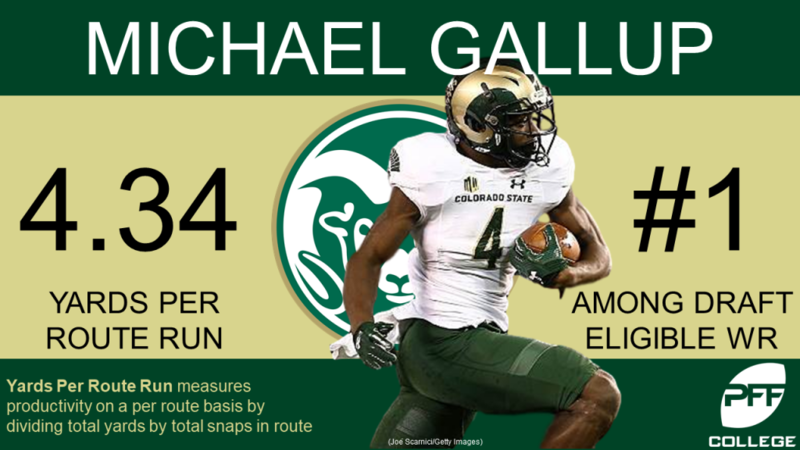 Michael Gallup is a receiver I am very high on pre-draft, maybe more than most. I feel his hype train is only growing as he gets pumped up by the likes of Matt Harmon and PFF. When you look at his production it speaks for itself. This JUCO to college product is poised and ready to take another step to be a productive receiver at NFL level. He competes on every play, makes intelligent reads and has the potential to be a #1 with some coaching and polishing as a wideout. 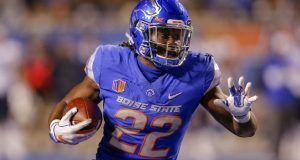 He was a hidden gem in the Mountain West in 2016 and I am glad to see him getting national recognition across the board after another fantastic season. Let’s dive in! Michael Gallup is a WR who grew up in Monroe, Georgia. He wasn’t able to move to Division I because of low test scores in high school so he attended JUCO at Butler community college wherein 2014 he had 780 receiving yards and 11 touchdowns. Following an injury, to his ankle, he was only able to play in 4 games and didn’t garner as much attention from scouts as he would have hoped. After receiving another notable offer from Kansas State, he decided to make the move from Kansas to Colorado. It’s rare ill touch on a player’s character but when looking heavily into Gallup I’ve become more of a fan of just the person he is. He had to humble himself in JUCO and came out of the other side a better person who is just happy to have a chance to play in the NFL. He’s a likable player who is humble and hungry for more. Check out this interview with the local media in Denver below. 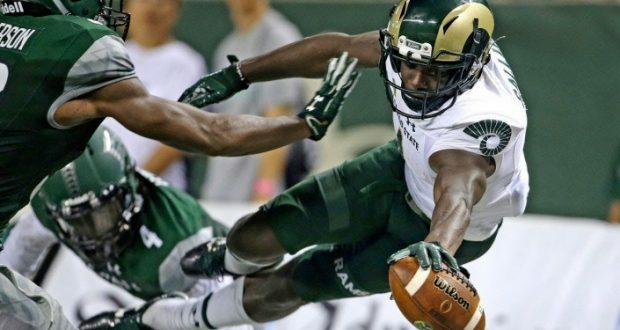 He attended Colorado State for his junior and senior seasons where he totaled 176 receptions for 2690 yards and 21 touchdowns in the two years. Even for the Mountain West, it is difficult to come in and dominate in the fashion that Gallup did and to be the guy so quickly on his team. They put their faith in him and he produced right away. In 2016 according to PFF Gallup led the nation in yards per route run in his first season of Division 1 football. While that’s extremely high efficiency, it is supported by his college market share data where he was had over 40% of his team’s yardage in 2016 and then following that up with 37.3% of his team’s yardage in 2017. Market share data is important to simply predict what kind of workload a player can handle and project what could be at the next level. He was the definitive number one receiver on his team and it proves he has the ability to produce high productivity with high volume. 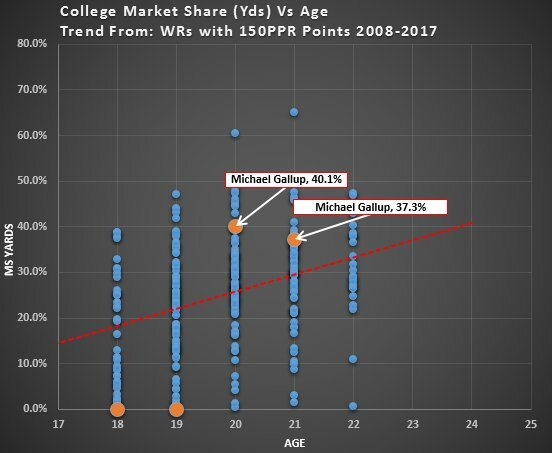 Gallup is still growing as a WR and you can see his improvements year over year. It’s something to take note of if you aren’t an analytics guy simply because he was so far above average and could be a predictor of future success at the next level. Gallup checks all the boxes metrically. At the combine, he was 6’¾” and 205lbs. He had a 36” vertical leap and at his pro day was able to improve on his broad from 122” to 128” (10’8”) showing he has great explosion and his ability to break arm tackles on film is supported by these explosives shown at the combine. He showed good speed at the combine running an official 4.51 and looked like he did that with relative ease in my opinion. He was able to improve on that figure also at his pro day posting a much more impressive 4.45. His game speed doesn’t always look like he’s 4.45 fast but when you see how effective he is in the screen game, the short passing game he is plenty fast enough to get open for short and intermediate routes and has great long speed to get open deep as well. He had a 6.95, 3-cone drill which was adequate, anything under 7 is pretty good. As far as footwork is concerned, he has some improving to do from that standpoint but doesn’t get jammed at the line much and shouldn’t have any issue with that at the next level because he plays and competes hard. He also recorded a 4.37 20- yard shuttle which is slightly disappointing but not a cause for concern. Gallup did in two years what some WRs couldn’t do in three as far as production goes. He is a great separator and had an above average passer rating when targeted on every route but a post and a fly in 2017. This is even with suspect quarterback play at times where he was completely overthrown and had no chance to make a play. Keep in mind he is doing these things with less time to form chemistry with his quarterback, 2 years rather than 3 or 4-year players at the same school. Like Christian Kirk, he had a bit of a QB carousel in his junior year, but in his senior year found some stability and increased his receptions and yardage despite decreasing in touchdowns. 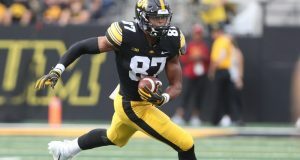 In 2017, he was more of a focal point for defenses, saw more double teams but still put up impressive numbers and finished as a consensus All-American wide receiver and a finalist for the Fred Biletnikoff Award. He has a great ability to go up and get jump balls, 50/50 balls, and his competitiveness comes into play here and is shown all over his tape. He is an intelligent receiver with the ability to read defenses very well and find holes in vacated zones, making sure he puts himself in the right spot for his quarterback to make a play and get him the ball. There are also times where he makes very athletic adjustments showing his ability to read the ball in the air and come up with difficult catches due to his quarterbacks’ inaccuracy. 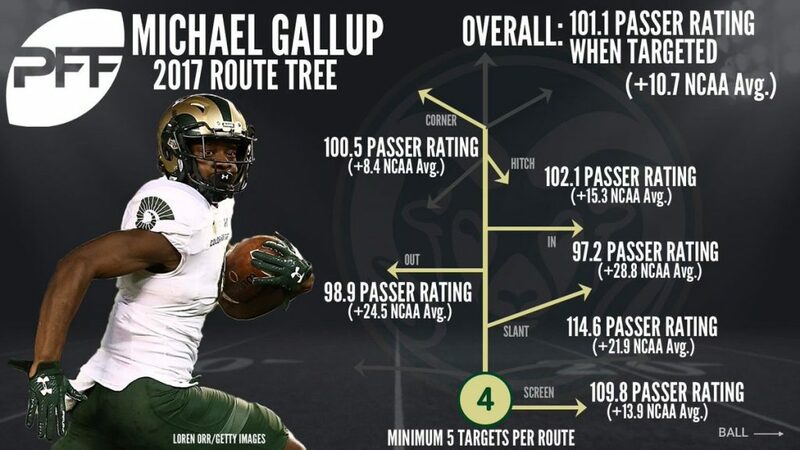 Gallup like many receivers in this class is not the perfect prospect. He is a player who can get frustrated at times, it will impact his game and he can be thrown off his line by physical corners. He can suffer from some concentration drops, but there was also a lot of misplaced balls when he was being thrown too, so it’s not entirely on him. I want to see him add some weight so he can put more body on corners and won’t get thrown off his line as much. Some polish in his footwork will do him well and he can really shine at the next level. People are going to question his competition which is understandable but it cannot be overstated enough that he really showed out all over the field not just racking up yardage by going deep and outrunning slower corners.